Food Blogga: Sweet Corn Season Has Begun in San Diego! Sweet Corn Season Has Begun in San Diego! It's May 23rd and fresh sweet corn season has begun in San Diego! Actually, it began about a month ago, but I've been too busy talking about camping, avocados, and pea shoots to focus on its arrival. So today it's all about the corn, baby. While sweet corn season generally runs from June through September, Southern California's corn season starts in April and lasts through October or November. 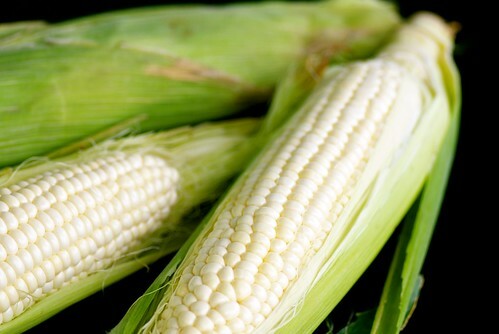 White corn reigns supreme here, particularly the Silver Queen variety, while bicolor or Butter and Sugar corn, is the next most popular. My personal favorite, thick, fat, canary yellow corn is hard to find, but that doesn't stop me from hunting for it every year. I purchased this white corn from Kawano Farms, a favorite vendor of mine at The Little Mercato market. It's crisp, mildly sweet, and ideal for sautéing or grilling to enhance its innate sweetness. In this Warm Quinoa, Corn, and Arugula salad, the corn kernels are lightly sauteed in olive oil and scallions and tossed with peppery arugula and nutty quinoa for a simple, vibrant lunch. I heard that a new bicolor corn called Peaches and Cream recently arrived at the Mercato. Peaches and cream corn? Seriously? I'd better bring a heavy duty, extra large garbage bag to fit all the ears of corn I plan on buying this weekend. 1. Add quinoa and water to a medium pot, and bring to a boil for 2 minutes. Lower heat to a simmer, and cook partially covered for 13 to 15 minutes, or until the water is absorbed. Cover and let sit for 5 minutes, then fluff with a fork. 2. In a medium saute pan over medium-high heat, warm olive oil. Add scallions and cook 2 to 3 minutes, or until lightly browned and wilted. Add corn and cook 2 to 3 minutes until lightly browned. Remove from heat. 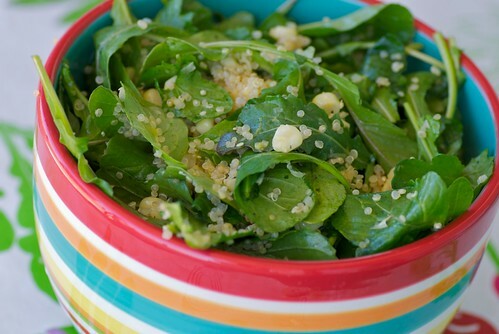 In a large bowl combine cooked quinoa, scallions and corn, and arugula. 3. To make the vinaigrette, whisk all ingredients in a small bowl. Pour over salad and toss well. Serve immediately. So jealous!!! I like it sauteed with basil - yum! Hi Susan! I bought some of So Cal's organic sweet corn the other day and it's so delicious! I'm jealous of your corn abundance; our season doesn't start until July. This recipe looks awesome and perfectly simple for summer. Thanks! Ahh. I remember "Peaches and Cream" corn from summers spent in Michigan as a kid. Beautiful gold and cream colored kernels mixed together. Good texture and great taste (when fresh.) You'll love it! How delightfully light! I can just taste the sweet corn with the spicy arugula and the punch of lemon from the vinaigrette; add quinoa and that pretty much hits every taste bud! Ah, the perfect bite - I think I'll try it this weekend. :) Thanks for sharing! This looks so tasty! If I start with fresh corn, should I steam it on the cobb first, or will it cook enough when I saute? Hi Susan! I just did a post on corn too and i have one ear worth of corn left so this is perfect. I was just thinking "i need a salad recipe with corn in it!" I really can't let it go to waste! I'm curious about the "peaches and cream" one you mentioned. Peaches and cream corn? Be still my heart. Up here in Brentwood, where the sweet corn rules the roost, we've been watching the stalks grow for weeks and weeks and weeks just waiting for the first harvest. Patience is indeed a virtue. This sounds wonderful! Love the colors and health factor!! Bi-color corn is my favorite! I think "honey and pearl" is what we grew up eating, but not until August -- any earlier was just disappointing. I will try to wrap my head around corn being in season now to take advantage of it. Ummmm, that photograph of the corn makes me long for some. christine-Hi, my friend! That late? Wow! It really is colder up where you are. maggie-Ooh, after your description, now I really can't wait. emily-What a lovely description. Many, many thanks! thebean-It will cook enough when you saute it. amee-Great minds? :) I just added a link to your post. It's fantastic! mary-Glad you found me too. Looking forward to getting to know you. stacy-Honey and pearl? That may win for prettiest name of all! sara-Thanks. The vinaigrette works well on most salads.